You can watch the entire interview below or on YouTube at this location. There's also this short video of Alex and Scott Medlock discussing the charity. The Hemispheres box set is slated for release 2 weeks from today on November 16th and will be made available as a 2 CD or 3 LP set along with a Super Deluxe edition that includes both the 2 CDs and 3 LPs along with a bonus Blu-ray disc. The set uses the Abbey Road Studios 2015 remastered edition of the album, along with a newly restored bonus recording of the band's June 1979 Pinkpop Festival performance in the Netherlands (with the 2112 performance replaced with one from a Tucson show in November 1978). The Super Deluxe edition also includes a 5.1 Blu-ray mix of the album (from Rush engineer Rich Chycki) and 4 bonus videos. 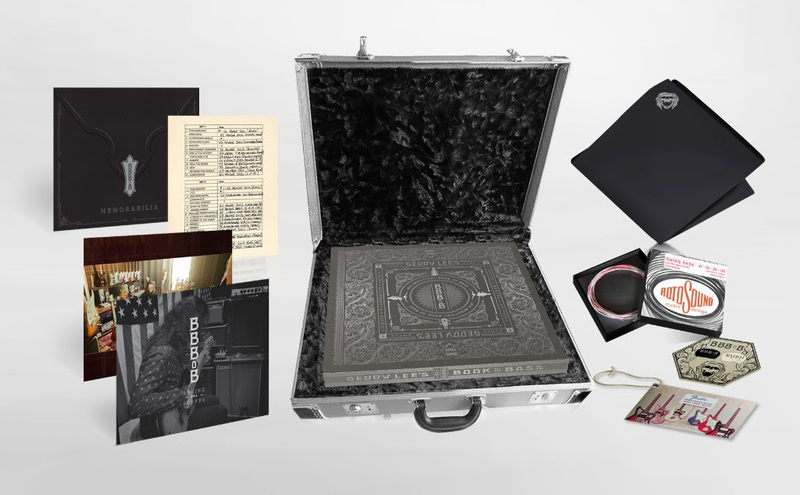 The Super Deluxe edition also includes several exclusive items, including a 40-page hardcover book with unreleased photos and new artwork by original album designer Hugh Syme. The Rush Backstage Club is also offering various merchandise bundles which you can check out here. There's currently a promotion where if you pre-save the set on Spotify, you can enter for your chance to win a Super Deluxe Edition of the box set. For all the details and to enter, go to this location. 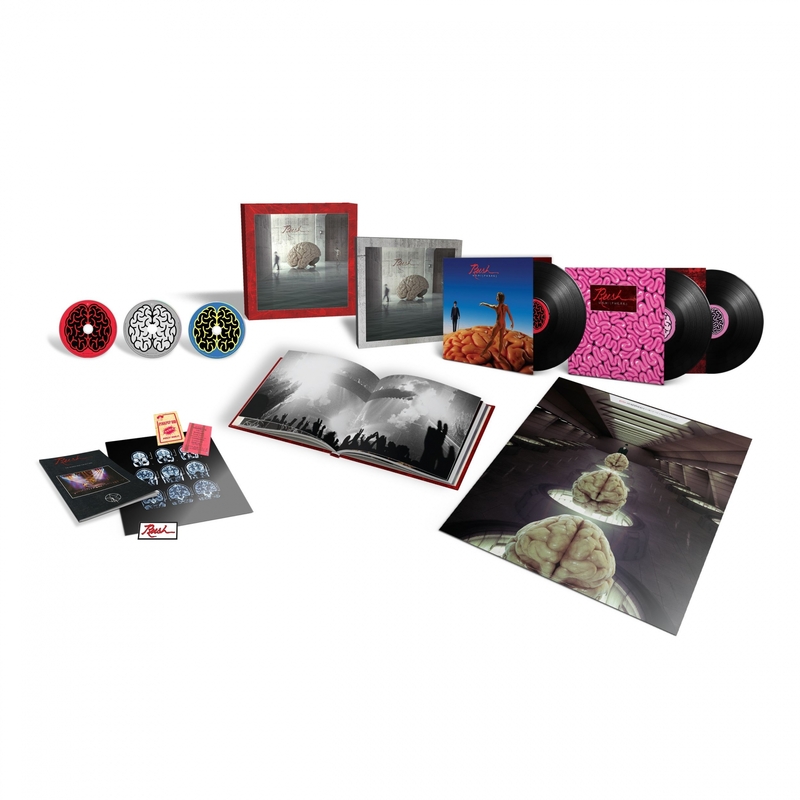 You can pre-order the box set now via Amazon (2 CD, 3 LP, Super Deluxe edition), and also check out this unboxing video. 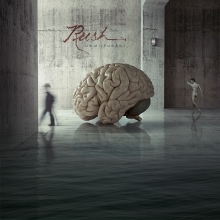 As mentioned above, last year Rush released their A Farewell to Kings 40th anniversary set, which included a CD of covers of a few of the album's notable tracks, including a cover of Cinderella Man by Canadian band The Trews. The Ole TV YouTube channel posted a video interview a few weeks ago where they chat with frontman Colin MacDonald about the cover. You can check out the interview on YouTube (thanks RushFanForever). The Kidney Foundation of Canada's annual A Brush of Hope charity auction fundraiser ended last week and Alex Lifeson's Self Portrait #2 painting wound up selling for over $12,000 CAD! 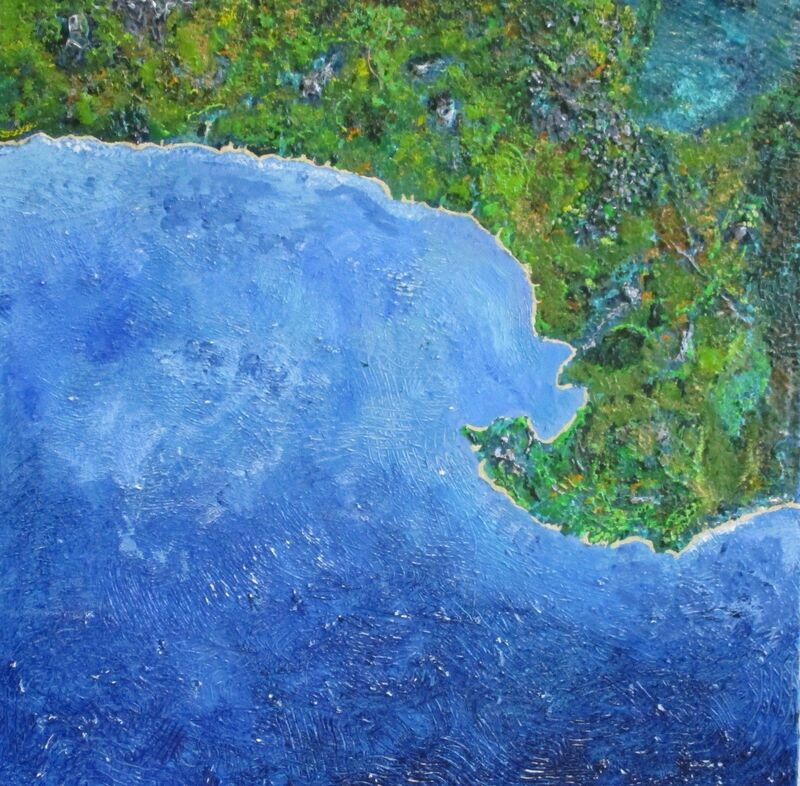 Alex has participated in the auction nearly every year since 2006, including last year with his painting 20,000 Feet Over The Sea which ended up selling for nearly $9,600 CAD. The Kidney Foundation of Canada is now offering a set of 100 limited edition prints of 20,000 Feet Over The Sea to raise money for the charity. Each print is numbered and personally signed by Alex Lifeson and comes on high quality, heavy stock, acid free paper along with a certificate of authenticity. The prints cost $200 CAD and you can purchase your copy at this location. For all the details and to pre-order your copy of either of the Limited Editions or the Standard Edition for $59.99, visit this location. They are also offering a Big Beautiful Book of Bass t-shirt and mug for sale. 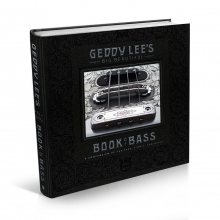 You can also pre-order Geddy's Big Beautiful Book of Bass via Amazon for around $40 at this location. Speaking of Geddy, Canadian culinary competition Canada's Great Kitchen Party (previously known as Gold Medal Plates) presented its annual Toronto Regional Qualifier for the Canadian Culinary Championships this past Monday, October 29th at the Metro Toronto Convention Centre, and Geddy Lee served as one of the judges for the competition. Chef Elia Herrera of Los Colibris took home the gold medal at the event, which was hosted by George Stroumboulopoulos and included performances by Ed Robertson, Tom Cochrane and others. Geddy Lee did not perform but did appear in a few Twitter photos such as this one, and this one. Geddy has participated as a judge for the event in the past. "When I was playing guitar with Mr. Big in the early 90s, we had the good fortune to support RUSH on their Presto and Roll the Bones tours. I was (and still am) a huge fan of RUSH, so I was thrilled to be able to meet them and to watch them play every night. 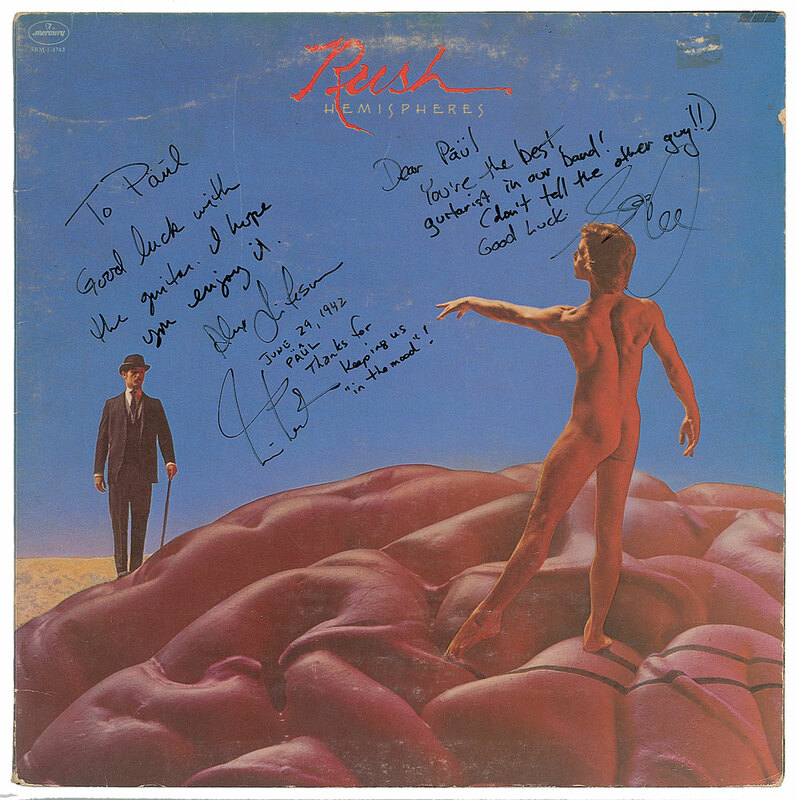 I asked Geddy, Alex, and Neil to sign my 'Hemispheres' album, and they were nice enough to write some great messages. All of Rush's crew, and all of Mr. Big's crew met me at the side of the stage...After several failed attempts, and threats of scissors, they finally managed to untangle the drill...At the next show, I was (carefully) getting ready to play with my drill again, when I saw that some signs has been posted for me. 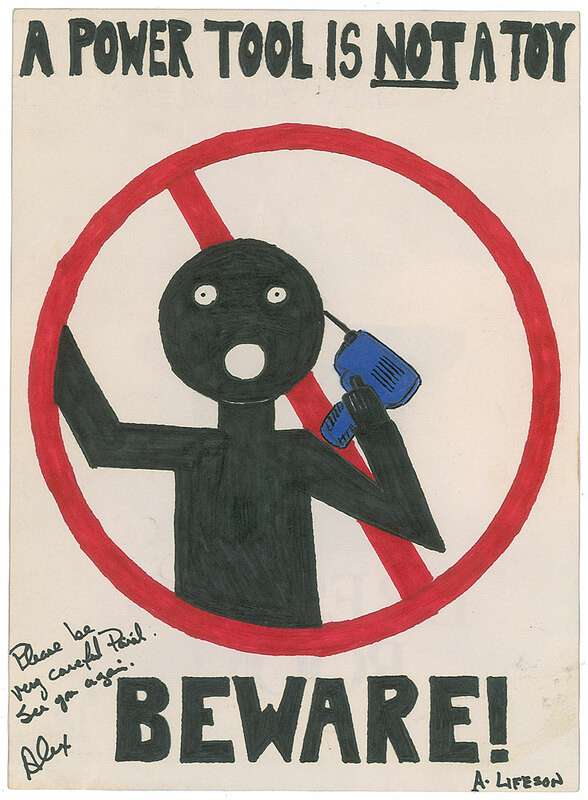 Alex Lifeson had made warning signs to make sure that I knew that 'A Power Tool is Not a Toy.'" For all the details visit the RR Auction website at this location (thanks RushFanForever). Ultimate Classic Rock posted a story this past week about the Pre-Fame Names of Rock's Most Famous Bands, and they mention one of Rush's early incarnations as Hadrian, although they got all the details very wrong. Rush/Hadrian: Canadian teenagers Alex Lifeson, Jeff Jones and John Rutsey formed Hadrian in 1968. Jones was soon replaced by schoolmate Geddy Lee on bass. 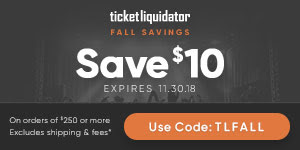 Three years later, the band changed their name to Rush. Still playing at high schools and local bars, they didn't release any music until 1973's cover of Buddy Holly's "Not Fade Away." After their first album in 1974, Rutsey grew tired of touring and quit. Rush, now without a drummer, held auditions to fill the role, which Neil Peart answered. Rush actually formed in 1968, but then briefly splintered apart in 1969, with Alex Lifeson and John Rutsey forming Hadrian with Joe Perna and a couple of others, while Geddy Lee had brief stints in Ogilvie and Judd. Rush then re-formed in 1970 with Lifeson, Lee, Rutsey and Mitch Bossi, before dropping Bossi in 1971. 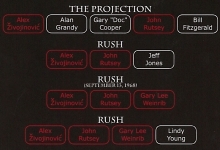 For a timeline of all the different early Rush variations, check out the Rush Family Tree chart that was included in the 2014 Rush: Rediscovered box set. This eerie sounding track from Moving Pictures became part of Rush's Fear series of songs, that also includes The Weapon from Signals, The Enemy Within from Grace Under Pressure and Freeze from Vapor Trails.